Kids will stare wide-eyed as they watch clear water or soda transform into a vibrant color? must be magic! What you?ll need: Plastic party cups, food coloring, ice, and any clear drink (I used Sprite, Fresca and Ginger Ale). Place 2 to 3 drops of food coloring at the bottom of each party cup and let dry. 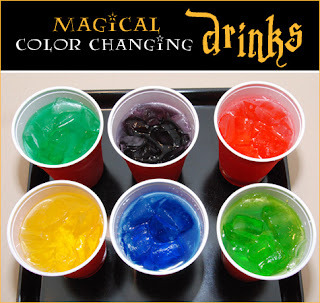 Just before serving the drinks, fill each cup with ice to hide the food coloring. While each child watches, pour the drink over the ice, and the clear water or soda will ?magically? turn into a color as it fills their cup! Use different colors of food coloring so that the kids won?t know what color to expect from their ?magic? soda. Thanks so much. I already have so many awesome ideas with this. Can't wait to try this! Do u think apple juice will work? Awesome idea. Can't wait to try this at my daughters frozen birthday party..